Phag Utsav is the unique way of celebrating Holi festival in the Govind Devji Temple dedicated to Lord Krishna in Jaipur in Rajasthan. Instead of color or gulal powders, flowers are used to play Holi here. The festival here celebrates the divine love of Radha and Krishna. The highlight of the festival is the reenacting of Lathmar Holi of Braj and Muslim artists pay homage to the immortal love of Radha and Krishna. The history of Phag Utsav is of more than 300 years and the reason for using flowers instead of color stems from the belief that the use of the color hurts the murti of Krishna. Artists from different places in India come here to perform before Krishna. At the temple, the greatest artist of the world, Krishna, witnesses the art of numerous performers which are performed as offering to Krishna. The vibrant folk songs and dances of Holi are performed at the temple for more than a week during the Phag festival. The legends of Radha and Krishna are showcased at the temple through different dance and art forms. Holi festival at Govind Devji Temple in Jaipur in Rajasthan is spread over several days. 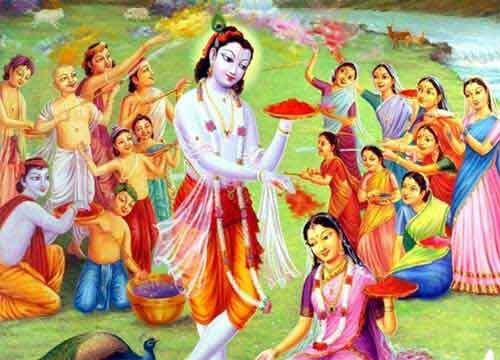 The main events at the temple are Rachana Chaki darshan, Phoolon Ka Holi (Holi with flowers), Holikotsav for three days, Pushp phagotsav for two days, Holipad, Braj Holi and Gulal holi. In addition to the said above festival the temple also celebrates the birth anniversary of Chaitanya Mahaprabhu. Raas lila is also performed during the period. The main festivals happen during the seven days before Holi.